1. Memory Eye and Star Eye cannot send you to the map. 2. Summon scroll and portal scroll can be used. 3. You cannot use random portal inside the legion cities, but can use town portal outside to go back Cronus. 4. No matter you have God’s Blessing or not, you cannot revive at where you are killed. Only revive potion can help you. 5. Damage share between spouses and BP sharing among family members are not available in legion land. When Legion War begins, all online players (except those in prison and those in booth) will be notified. Click yes then you will be sent to the map. If you miss this notice, you can also talk to Count Christ (Cronus 220,466) and he will be pleased to send you to the map at any time, but invaders can only attack the pole during the Legion War period. Occupants will be sent into the city directly. Legion leader and deputy can repair the walls. Invaders and non-legion-member will be sent to the outside of the city randomly. The only way to the city is to destroy the gate. a) All players in game, no matter you are legion member or not, can join in the war. But players who are in prison and who are opening the booth cannot. b) Eudemons are not allowed to use ranged-attack such as the wind beads skill while in the map, but they can use such kind of XP skills. d) Once players entered the map, legion PK mode automatically starts. (a) There’s an out city and a core city and each is with a gate. There’s a pole in the out city and a shield in the core. (b) An invader who hits the legion pole will be rewarded with gold and its legion war contributions. When the pole is destroyed, the legion with most contributions will occupy the pole. (c) An invader who hits the legion shield will also be rewarded with gold. (a) The invader needs to break both city gates and all the objects inside. (b) If the invader destroys the pole after the shield is destroyed, the invader will occupy the legion land. If the invader destroys the pole before the shield is destroyed, the pole is automatically re-generated. The occupation of the pole will start again. (c) If the occupant of the pole is not the defender when the shield is destroyed, the destroyer of the pole will occupy the legion map. The occupant of the pole needs to save legion funds in advance. One gold equals 10 HP. During the war the pole can recover up to 20,000 HP every 5 seconds before the legion fund runs out. If the legion fund runs out, the pole will receive 10-fold damages. (a) You can buy revive potion from Item|Gear Shard SHOP at market to revive yourself when you are killed after 20 seconds. You can also use it to revive your eudemons when they are killed, but it will take 20 seconds for eudemons’ reviving. (b)You can also revive yourself and your eudemons by clicking ‘Revive’ near the entrance after 90 seconds. (c) If you exit the game when you are dead, you will appear in the rest room in the next login. PK is not allowed in the rest room. During the legion war, you can go back to the war map by talking to NPC (52,52) when you have stayed in the room for 5 minutes. If the wartime is not arriving, you can use Town Portal to go back to Cronus at any time. Rewarding at legion lands are divided in few ways. All legions what will try to take over legion land will gain GOLD by hitting Pole (great amounts). By hitting SHIELD challenger will be getting 1 EPs per every 400000 Damage! Defenders during lasting LW will be automatically gain +1 EPs every 1 minute by just participating! (THIS is is LIMITED to members with rank at least LeaderSecretary! Monsters spawn Only within castle walls! There are 2 type of monsters: Legion Spirit and Legion Zombies. 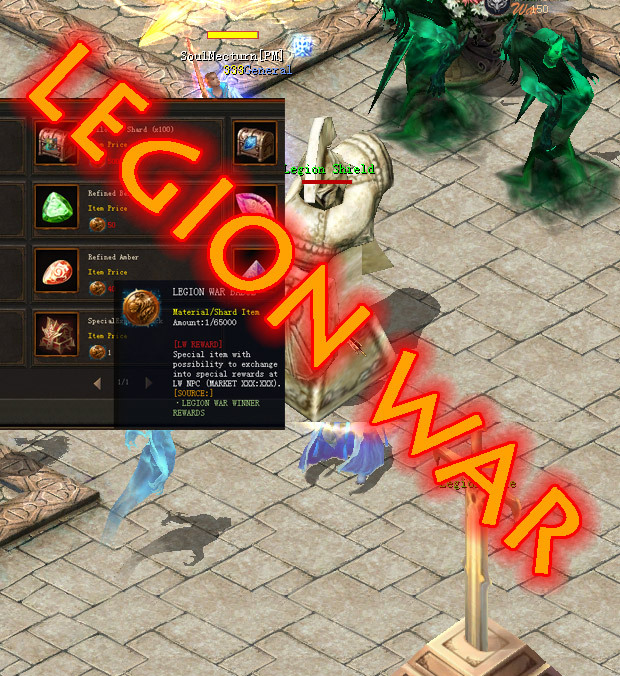 Legion Spirit can provide by chance +1 EPs when killed and additionally for “Defenders” can RARELY provide +1 LW Badge! Legion Zombie can provide +1 EPs by chance when killed + additioanlly as chance for both sides can provide PATK and MATK BOOST for whole legion fighting on LW lasting 30 seconds! More updates for LW will arrive! 0 Comments ON " LEGION WAR "